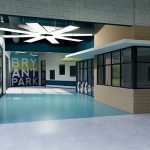 CLAY – Renderings of Bryant Park Elementary School, a brand-new K-5 elementary school slated to open in the Spring of 2020, have been approved and released today by the project’s architect, Turner Batson. 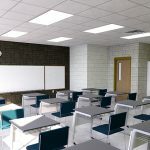 The new school will be built within the Clay City limits behind Bryant Park and the Boys and Girls Club off Old Springville Road and is expected to reduce the number of students at both Chalkville and Clay Elementary Schools as well as pull Grayson Valley students from Pinson schools. 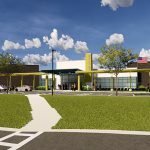 The new school is part of a $230 million Jefferson County School Board project that will affect a total of 16 schools, including seven new schools and nine school renovations. 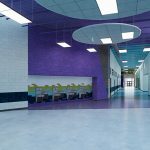 See an image gallery of the new school below. 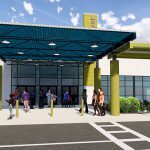 Image of the front of the new K-5 elementary school in Clay, Bryan Park Elementary, expected to break ground in January 2019. Renderings provided by Turner Batson Architects. Image of the main canopy outside the front of Bryant Park Elementary School. Renderings provided by Turner Batson Architects. Bryant Park Elementary School lobby. Renderings provided by Turner Batson Architects. 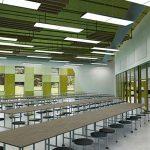 Image of the Bryant Park Elementary School cafeteria. Renderings provided by Turner Batson Architects. Image of the inside of Bryant park Elementary School. Renderings provided by Turner Batson Architects. 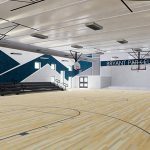 Bryant Park Elementary School gymnasium. Renderings provided by Turner Batson Architects. Rendering of one of the Bryant Park Elementary Schools classrooms. Renderings provided by Turner Batson Architects.